Draft: 2007, Texas Rangers, 17th rd. Full name is Mitchell Austin Moreland. Signed by Art Gardner (Rangers). He and his wife, the former Susannah Higgins, were married on 11/13/11...They have 2 sons, Crue Howell (born 7/25/12) and Ledger Bryce (born 1/29/18), and a daughter, Swayze Ann (born 10/17/14). Played 3 seasons (2005-07) at Mississippi State, where he hit .332 (144-for-434) with 91 RBI in 129 games....Also went 5-0 with 2 saves, a 3.31 ERA (12 ER/32.2 IP), and 45 SO in 25 pitching appearances. Graduated in 2004 from Amory (MS) High School, where he went 25-2 in 3 varsity seasons...Posted a 0.53 ERA and averaged 18.3 SO/9.0 IP as a senior (55.0 IP, 112 SO)...Named a 2004 Louisville Slugger All-American. In his 2nd season with BOS, appeared in 124 games and hit .245 (99-for-404) with 15 HR and 68 RBI...Named an All-Star for the 1st time in his career (elected via the player ballot). Was rated the AL's best defensive 1st baseman in the annual Baseball America Best Tools survey, which polls managers, scouts, and executives. Named a finalist for a Rawlings Gold Glove Award. Made only 2 errors in 809 total chances (66 assists). Hit 4 triples, all in a span of 26 games from 5/26- 6/23, after he hit 3 in his first 957 career games. In 62 games at Fenway Park, hit .274 with an .827 OPS (57-for-208)...Hit 9 of his 15 HR on the road. Batted .242 vs. LHP (23-for-95) and .246 vs. RHP (76- for-309)...Hit 13 of his 15 HR against RHP. Went 6-for-11 (.545) with the bases loaded...In 42 games batting cleanup, hit .301 with a .917 OPS (47-for-156, 9 HR). Started the season 0-for-12, but went 38-for-111 (.342) with a 1.102 OPS in 32 games from 4/11-5/29...21 of his 38 hits in that time went for extra bases (8 HR). Homered in 6 of 13 games from 4/18-5/9, including in 3 straight from 4/30-5/5. Hit a grand slam in the Sox' 7-3 win at OAK on 4/20, his 4th consecutive game homering at Oakland Coliseum... Is 1 of only 6 players in the ballpark's history (1966- 2018) to homer in 4+ straight games there as a visitor. Went 3-for-4 with a HR on 4/30 vs. KC and 3-for-6 with a HR on 5/1 vs. KC, the 1st time in his career he recorded 3+ hits and a HR in back-to-back games. Recorded at least 1 XBH and 1 RBI in 5 straight games from 4/30-5/9, the longest such streak of his career...In those games, went 11-for-21 (.524) with 4 HR, 2 2B, and 8 RBI. Went 2-for-3 and played 5 innings at 1B in the 89th All-Star Game on 7/17 at Nationals Park, helping the AL earn an 8-6 win in 10 innings. Entered the ASG in the 6th inning as a defensive replacement for José Abreu...Singled off Josh Hader in the 8th inning and off Ross Stripling in the 10th. Delivered a walk-off RBI single on 9/9 vs. HOU... Entered the game as a pinch hitter in the 8th inning and singled, then stayed in the game at 1B...Broke a 5-5 tie in the 9th inning with a 2-out single. POSTSEASON: Appeared in 11 postseason games and started 3 of them, posting a .294/.368/.529/.898 batting line (5-for-17, 2B, HR, 3 R, 5 RBI). Reached base in 4 of his 7 PA as a pinch hitter, going 2-for-5 with 1 BB, 1 HBP, 1 HR, and 5 RBI. In Game 4 of the World Series at LAD, hit a pinch-hit, 2-out, 3-run HR in the 7th inning, cutting the Sox' deficit from 4-0 to 4-3...BOS came back to win, marking their largest comeback victory in World Series history. In his 1st season with the Red Sox, hit .246 (125-for-508) with 22 HR, 79 RBI, and 73 R...Set career highs in games (149), at-bats (508), runs (73), doubles (34), and walks (57). Drew a walk every 10.11 PA, his best rate of any full season...Struck out once every 4.80 PA, his best rate since 2012 (5.03). Named a finalist for a Rawlings Gold Glove Award at 1B...According to FanGraphs, his 10 defensive runs saved were tied for the most among AL 1st basemen. Did not miss any time on the disabled list despite suffering a fractured left big toe on 6/13. Had 2 streaks of homering in 3 consecutive games (5/18-21 and 6/24-26)...Was the 1st Red Sox player with multiple streaks of 3 straight games with a homer in a single season since Adrián González in 2011. Began the season 0-for-12, but then reached base in 11 of his next 15 PA (9-for-13, 2 BB). Set a BOS franchise record-and tied the AL record-for consecutive games with a double (7) from 4/7-13. Led the majors with 12 2B in April...The only other Red Sox player in the last 100 years with as many as 12 2B before 5/1 is Mike Napoli (13 in 2013). From 5/18-21 at OAK, homered in 3 consecutive games for the 1st time in his career. Recorded an RBI in 6 straight games from 5/18-25, tying the longest streak of his career (also 7/26-31/16). Had a season-best 10-game hitting streak from 6/4-16. Hit by a pitch in the 1st inning on 6/13 vs. PHI, fracturing his left big toe...Remained in the game and went 2-for-5, homering in the 3rd inning. Matched his career-long streak by homering in 3 straight games from 6/24-26. Batted .119 (10-for-84) with 0 HR during a 25-game stretch from 6/28-7/29, while dealing with his injured toe. In his next 27 games from 7/30-8/30, posted a .346/.404/.667 batting line (28-for-81, 8 2B, 6 HR). Recorded his 1st walk-off HR as a member of the Red Sox (3rd of his career) on 8/4 vs. CWS, breaking a 2-2 tie in the 11th inning with a 2-out, 2-strike solo shot. Each of his 7 hits from 7/30-8/5 went for extra bases (5 2B, 2 HR). Homered on 8/23 at CLE and added his lone multi-HR game of the season the following day, also at CLE. In the Sox' 16-3 loss to BAL on 8/25, started at 1B before pitching a scoreless 9th inning (2 H, 1 SO)...Became the 1st position player to pitch for the Red Sox since Ryan LaMarre (7/2/16 vs. LAA) and the 1st to record a strikeout since Jonathan Van Every (5/8/10 vs. NYY). On 8/30 at TOR, broke a 1-1 tie with a 2-run, pinch-hit HR in the 7th inning and added a 2-run single in the 8th. Homered in 4 of his final 14 games, including in back-to-back games on 9/27 vs. TOR and 9/28 vs. HOU. Had at least 1 hit and scored at least 1 run in each of his final 4 games of the season (9/27-30). POSTSEASON: Appeared in all 4 ALDS games vs. HOU, leading the Sox in runs scored (4) and doubles (tied, 2). Won the AL Rawlings Gold Glove Award at 1B...Tied his career best with 147 games played and batted .233 (107-for-460) with 22 HR and 60 RBI. Led the AL with a .998 fielding % (2 E/1,103 TC) in 139 games (118 starts) at 1B, the highest mark in club history (min. 100 games at 1B)...His .9982 mark ranked 2nd in MLB to LAD's Adrian Gonzalez (.9983)...Did not commit an error in his final 52 games of the season (last error: 7/31 vs. KC). After the All-Star break, batted .382 vs. LHP (13-for-34, 3 2B, 2 HR). Hit 14 of his 22 HR during a 52-game span from 6/8-8/13, posting a .316/.366/.645 batting line in that time. Led the majors with a .750 SLG in July (19-for-56, 2 2B, 7 HR)...His 7 HR from 7/18-31 led the AL and were tied for most in the majors (also Jay Bruce and Jedd Gyorko). Named AL Player of the Week for 7/25-31 (10-for-22, 5 HR, 9 RBI). POSTSEASON: Appeared in all 3 ALDS games vs. TOR, going 2-for-8 with 2 2B and 2 RBI...Started Games 1 and 3. 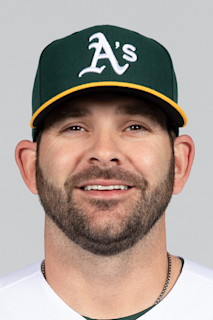 In his most consistent major league season to date, Moreland established career highs in several categories as he batted .278 (131-471) with 23 HR and 85 RBI over 132 games for Texas…played bulk of season with a balky left ankle and set career bests in average, slugging (.482), hits (131), HR (tied- 23), RBI, doubles (27), XBH (50), and total bases (227)…ranked among team leaders in HR (tied for first), RBI (second), OPS (third, .812), total bases (fourth), and doubles (fifth)…had 117 starts, 110 at first base and seven as DH. Missed majority of the season following ankle surgery in June, as his most recent ML contest was 6/7/14 vs. CLE...batted .246 (41-167) with 2 HR and 23 RBI in 52 games, his fewest games since his rookie season of 2010 (47)...hit just .120 (3-25) against left-handers...had .301 (22-73) figure with runners on base, .313 (15-48) with runners in scoring position...hit .294 (30-102) over first 36 games through 5/20, then batted .169 (11-65) last 16 games ahead of his surgery...started just 2 of the club's first 41 games at first base, but started 20 of next 21 games following Fielder injury...went 5-for-8 as a pinch-hitter, T8th-most pinch hits in the A.L...pair of career high-matching 3-hit games, 5/9 vs. BOS and 5/25 at DET...was placed on DL 6/8 with Os Trigonum Syndrome in his left ankle...underwent season-ending reconstructive surgery on his left ankle on 6/23/14 performed by Dr. Robert Anderson in Charlotte, NC...transferred to 60-day disabled list on 7/24. Batted .232 (107-462) with 24 doubles, 23 homers, and 60 RBI in 147 games for Texas, establishing career highs in games, doubles, homers, RBI, walks (45), total bases (202), and runs (tied-60)…his .232 average ranked as 4th-lowest among A.L. qualifiers and was well below his career .264 clip entering 2013 … was lowest qualifying average by a Ranger since Benji Gil hit .219 in 1995, lowest in a full season since Dean Palmer's .229 in 1992 … led the Rangers with 129 starts at first base, 3rdmost starts in the field of any Ranger behind only Adrian Beltre (146) and Elvis Andrus (145)…missed just over 2 weeks on the disabled list from June 6-20 with a right hamstring strain. Missed 31 games in June and July due to a strained left hamstring in 2nd major league season...placed 5th on the club in slugging (.468) and 6th in batting average (.275) among all Rangers with at least 300 at bats and was 6th on the team in homers (15)...started 82 games at 1st base and 6 as the designated hitter...was on the 15-day disabled list, June 20-July 29...suffered the injury running out an inning-ending GIDP ball in the 2nd inning on July 19 at SD...combined to hit .263 (5-19) with 2 doubles, an RBI, and 4 runs scored in 5 rehab games with Round Rock (AAA) and Frisco (AA).BATTING: Hit .139 (5-36) in 1st 12 games through April 24...from April 25-May 26, batted .392 (29-74) with 7 HR and 15 RBI in 25 games to rise to a season-high .309...hit .188 (9-48) over next 18 games through his injury on June 19 to fall to .272...in 1st 29 games after his return from the DL, July 30-Aug. 29, batted .337 (30-89) to raise season figure from .272 to .296...beginning Aug. 31, hit .213 (17-80) in his last 30 games with no home runs and 5 RBI...his .318 average at Rangers Ballpark was 3rd best among all Texas players behind Adrian Beltre (.346) and David Murphy (.335)...matched career high with 3 hits on 3 occasions (10 total times): May 5 at CLE and May 25-26 vs. TOR...highest monthly averages came in May (.324, 11th in A.L.) and August (.329, 16th in A.L. )...matched career high with 9-game hit streak, Aug. 18-26, batting .394 (13-33) in that span.HOME RUNS / RBI: Led the majors with 9 home runs while batting 9th in the order...homered twice on May 17 vs. OAK, his 4th career multi-HR game...had 1st career pinch HR on June 9 at SF, hitting ball into McCovey Cove over RF wall...hit 1st career grand slam on Aug. 22 vs. BAL...had no HR and 5 RBI in last 30 games with an at-bat...matched career high with 5 RBI on Aug. 22 vs. BAL (3rd time)...joined Adrian Beltre (5 RBI in that game) in the 1st instance of multiple Rangers having 5+ RBI in the same game since Aug. 22, 2007 at BAL (1)...the duo each had 4 RBI in the 4th inning of that game, 1st time in Washington/Texas history for multiple players to have 4+ RBI in one frame (Elias Sports Bureau).FIELDING: Compiled a .996 (3 E/751 TC) fielding percentage in 95 total games at 1st base, the 5th best mark in the A.L. (90 or more games)...did not commit an error in 1st 35 games before miscue on June 14 and ended year with 25-game errorless streak...his career fielding percentage of .995 (9 E/1847 TC) in 234 games is the 3rd best in club history among 1B with at least 225 games behind Jim Spencer (.997) and Mark Teixeira (.996)...also appeared in 3 games in right field with 3 errorless chances...were his fewest OF appearances in 3 ML seasons.MISCELLANEOUS: Led the Rangers in pinch at bats (18) and hits (4)...missed games April 14-15 at MIN and returned to Dallas on an off day, April 16, for a root canal on an abscessed tooth...had both of Rangers' extra-base hits on May 21 at SEA, just 5th time in club history for Texas to have multiple extra-base hits in a game, all from the last spot in the lineup...was in the lineup just twice against left-handed starters, Aug. 25 vs. MIN (Brian Duensing) and Sept. 19 at LAA (C.J. Wilson)...had a 3-run HR off Duensing...hit .391 (9-23) as the DH....batted .313 (20-64) when leading off an inning...5 of his 23 total walks were intentional.POSTSEASON: Has appeared in 25 of the Rangers' 34 postseason games the past 3 seasons, batting .250 (19-76) with 3 HR and 10 RBI...his HR and RBI totals are both tied for 6th all-time in Rangers postseason history...fanned as a pinch-hitter in 2012 Wild Card Game vs. BAL...went 3-for-29 with 2 HR in 2011...Rangers were 7-1 in his 8 starts...started Games 4 and 5 of the World Series and appeared as a defensive replacement in Game 6...hit a solo home run in Game 5, his 2nd career World Series HR batting 9th, just the 4th player ever to hit 2 home runs from that spot in the Fall Classic...his 2-run HR in 2011 ALDS Game 2 vs. TB was his 1st HR since August 19 at CWS...started 13 of club's 16 postseason games in 2010 and appeared in 15 overall contests...batted .348 (16-46) with a HR, 4 doubles, and 7 RBI, posting the highest average and on-base pct. (.400) among regulars...hit safely in 13 of his final 14 postseason games and was the only Ranger with a hit in all 5 World Series games vs. SF...hit a 3-run HR off Jonathan Sanchez in Game 3, becoming the 1st left-handed batter in ML history to homer in the WS off a LHP after never previously homering off a lefty in a regular season or postseason game. Made his first career Opening Day roster and served asthe club's starting first baseman for most of the year, registeringone of the top fielding percentages in the majors at the position...also saw limited time in right field and as the DH...appeared in134 of the Rangers' 162 games, nearly 3 times the number ofgames he played in during his 2010 rookie campaign (47), andestablished career highs in most offensive categories. Recalled from Oklahoma City (AAA) on July 27 for his firstmajor league action, Moreland spent the rest of the season withthe Rangers, starting 41 of the club's final 61 games ... was 3rdplayer from Rangers' 2007 Draft to appear in the majors, joiningTommy Hunter and Julio Borbon ... had 145 big league at-bats,negating his rookie status. Named the Rangers organization's best position player after combining to bat .331 (156-471) with 16 home runs and 85 RBIin 116 games with Bakersfield (High-A) and Frisco (AA) in his 3rd professional season...appeared in 68 games in right field, 39 atfirst base, and 10 as DH...went consecutive games without a hit just 3 times all year, and never had a drought longer than 2games...reached base safely via hit, walk, or hit by pitch in 102 of 116 games (88.0%)...missed final 3 weeks of the season with afracture in his right foot...in addition to ranking 13th among all full season minor leaguers in batting average, at the time of the injuryhe also ranked among leaders in extra-base hits, on-base pct., and hits...after the injury, played in Arizona Fall League to finish outthe year...had the highest batting average of any qualifier in the Texas organization and ranked 5th in RBI...had 45 multi-hit gamesin 116 contests (38.8%), including 16 games with 3+ hits and 5 games with season-high 4 hits...posted 20 multi-RBI contests, including4 games with 3-or-more RBI, all of which came at Double-A...scored season-high 3 runs in a game 6 times...was organization'sPlayer of the Month for May after batting .359 (38-106) with 14 doubles, 4 home runs, 17 RBI, and 14 walks in 27 games spanninghis promotion to Frisco...named to Baseball America's Midseason All-Surprise Team at first base. Led the Midwest League in average (.324), RBI (99), slugging percentage (.536), and extra-base hits (59)...ranked among theleague leaders in hits (2nd, 151), on-base percentage (2nd, .400), doubles (3rd, 37), and home runs (5th, 18)...named to the MidwestLeague Post-Season All-Star Team...finished 2nd in MVP voting to Beliot's Ben Revere (Minnesota)...starting rightfielder for the Westdivision in the Midwest League All-Star Game...hit .324 (46-142) with runners in scoring position...recorded hits in 11-of-12 gamesto start the season and batted .357 (15-42) over 11 games in April...hit .315 (35-111) with 5 home runs and 18 RBI in May...did nothit first home run of the season until May 2 at Kane County...hit grand slam May 31 vs. Beloit...posted season-best 12 game hit streakfrom May 21-June 2, batting .448 (22-49) with 5 doubles, a triple, 3 home runs, and 7 RBI...had first career multi-home run game and a season-high 4 hits July 5 at Burlington...hit .380 (41-108) with 5 home runs and 23 RBI in August...had 2nd multi-home run gameAug. 17 vs. Peoria...named Midwest League Player of the Week on Aug. 17 after hitting .393 (11-28) with 3 doubles, 5 home runs,and 12 RBI...ended season with 8-game hit streak at .451 (14-31)...appeared in 2 games as a pitcher, posting a 4.50 ERA (1 ER/2.0IP) with 3 strikeouts...also spent time on mound in instructional league following the season. Spent first professional seasonat Spokane...appeared in 21 games at first base, 5 as the DH and one in right field...launched first professional home run in his secondgame, Aug. 6 vs. Salem-Keizer...hit safely in 12 of his first 15 games for the Indians, going 18-for-61 (.295) with 2 home runs and10 RBI. December 18, 2017 Boston Red Sox signed free agent 1B Mitch Moreland. November 2, 2017 1B Mitch Moreland elected free agency. December 8, 2016 Boston Red Sox signed free agent 1B Mitch Moreland. November 3, 2016 1B Mitch Moreland elected free agency. May 13, 2015 Texas Rangers activated 1B Mitch Moreland from the 15-day disabled list. May 9, 2015 Texas Rangers sent 1B Mitch Moreland on a rehab assignment to Round Rock Express. April 29, 2015 Texas Rangers placed 1B Mitch Moreland on the 15-day disabled list retroactive to April 28, 2015. Left elbow surgery. November 3, 2014 Texas Rangers activated 1B Mitch Moreland from the 60-day disabled list. July 24, 2014 Texas Rangers transferred 1B Mitch Moreland from the 15-day disabled list to the 60-day disabled list. June 21, 2013 Texas Rangers activated 1B Mitch Moreland from the 15-day disabled list. June 17, 2013 Texas Rangers sent 1B Mitch Moreland on a rehab assignment to Frisco RoughRiders. July 30, 2012 Texas Rangers activated 1B Mitch Moreland from the 15-day disabled list. July 27, 2012 Round Rock Express sent 1B Mitch Moreland on a rehab assignment to Frisco RoughRiders. July 23, 2012 Mitch Moreland assigned to Round Rock Express. June 22, 2012 Texas Rangers placed 1B Mitch Moreland on the 15-day disabled list retroactive to June 20, 2012. Left hamstring strain. July 29, 2010 Texas Rangers selected the contract of 1B Mitch Moreland from Oklahoma City RedHawks. April 7, 2010 Mitch Moreland assigned to Oklahoma City RedHawks from Frisco RoughRiders. January 15, 2010 Texas Rangers invited non-roster RF Mitch Moreland to spring training. September 26, 2009 Mitch Moreland roster status changed by Frisco RoughRiders. August 17, 2009 Frisco RoughRiders placed RF Mitch Moreland on the 7-day disabled list. May 26, 2009 RF Mitch Moreland assigned to Frisco RoughRiders from Bakersfield Blaze. April 9, 2009 Mitch Moreland assigned to Bakersfield Blaze from Hickory Crawdads.